MINETTO – Minetto Elementary School fourth graders were excited to bring historical figures to life with their recent biography projects. 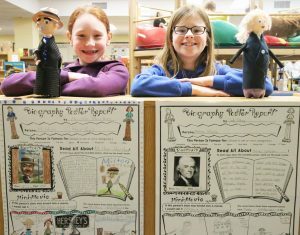 Minetto fourth graders Marissa Sharkey and Jade Scheg proudly show off their biography projects, based on the historical figures Milton Hershey and Thomas Jefferson. The entire grade level worked on similar research efforts. Lessons from both their classroom and the library media center prepared them for their solo research project, which included studying their subject, preparing a biography poster and crafting a character, among other tasks. With more information learned, the students’ excitement around their historical figure grew. Jade Scheg said she was thrilled to research Thomas Jefferson, after having recently visited the namesake memorial. She said the biography project made her delighted to learn more about what, how and why Jefferson accomplished what he did. A favorite fact she found out was Jefferson thoroughly enjoyed science and math, just as Scheg does. Library media specialist Kimberly LeRoy said she led mini-book talks about dozens of historical figures, guided the students on note-taking, taught about trusted online resources and continued the preparation of helping the students to become fully prepared and life ready. Each year at Minetto Elementary, LeRoy builds on the research process, so students will succeed at both the Oswego Middle School and Oswego High School.